Last Saturday while I was wandering around the Main Street Farmer's Market, absorbing the fabulousness of the season, Matthew Vandenberg of Rideau Pines Farm stopped me at his booth with a tempting proposal. 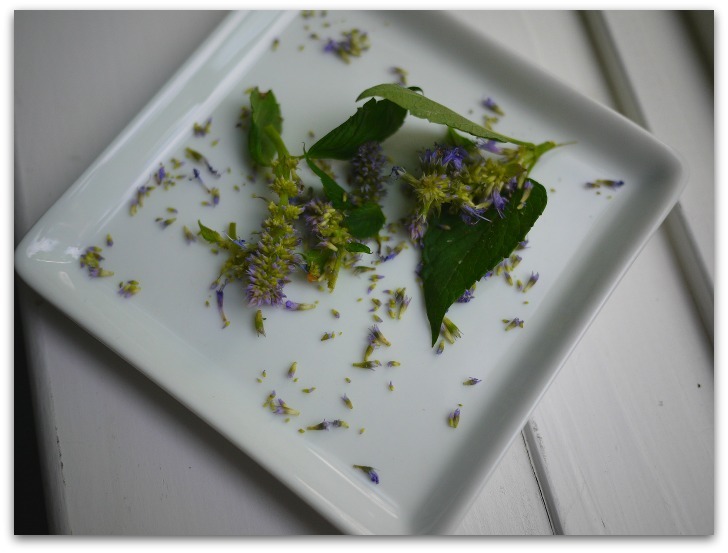 "Taste this", he offered and pointed towards a little green plant with tiny purple flowers. I popped a few of the tiny flowers in my mouth. At first I thought they were stevia blossoms but then another flavour emerged: liquorice, bright and clean. "It's anise,” he piped in. What an intriguing flavour. I cruised through my mind to come up with a pairing that would compliment but not overwhelm it. Strawberries? No. Peaches? Yes, peaches... So off to the peach stand and then to the kitchen. 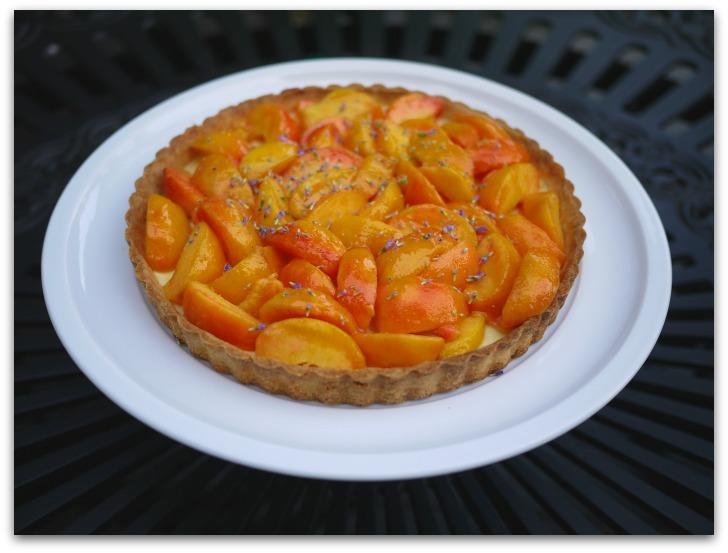 This tart is a mixture of Canadian Niagara peaches, a classic French tart crust and a not too sweet and smooth Italian ricotta filling. A mixture of three delicious things from three of my favourite places in the world, all brought together by these tiny little blossoms. Thanks, merci, and grazie Matthew! This recipe is comprised of a classic French pâte sucrée crust with ground almonds, filled with a light tasting cream mixture based on ricotta and topped with fresh peaches. I added anise blossoms to the ricotta mixture and sprinkled them on top of the tart. 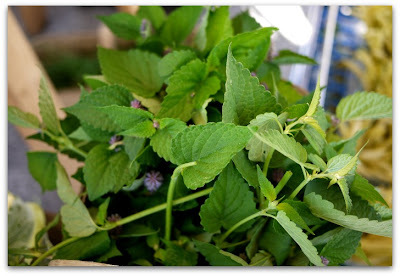 If you can't find anise blossoms which will probably be the case, you can make the tart with cinnamon or lemon basil blossoms or freshly ground nutmeg instead. It will still taste great! 1. Prepare the pâte sucrée. Have all the ingredients measured and at hand. Mix the egg yolk and cream together. Place the flour, sugar, powdered almonds and salt in a sifter and sift onto a clean counter top or large bowl. Sprinkle the butter pieces on top of the flour mixture. Using the tips of your fingers and working quickly, sablé, or mix the butter into the flour mixture until it is evenly and completely incorporated and resembles course sand. Create a well in the middle of the flour mixture, and add the cream and egg mixture. Using a fork, gently mix the two until the dough just comes together. Turn the dough onto your work surface and knead a couple of times to bring it all together. Form the mixture into a flat disc and wrap in plastic wrap. Refrigerate for at least one hour. Remove the dough from the refrigerator. Lightly flour your work surface and rolling pin as needed while you roll the dough to 2” wider than the tart pan. Gently place the rolled dough into the pan. This dough is quite forgiving so if there are holes or tears, just patch it with any leftover pieces. Press the dough into the bottom and sides of the pan and then trim the overlap. Put the pastry lined tart pan in the refrigerator to rest for about 1 hour. While the tart shell is resting, prepare the filling and preheat the oven to 350˚/180˚C. Place the ricotta, sugar, cream, orange rind, vanilla and two egg yolks in a blender, food processor or in a high, narrow bowl if you're using an immersion blender. Mix all the ingredients until smooth. Stir in the blossoms or nutmeg. Refrigerate until needed. Pour the filling into the tart shell and place it on a rack in the middle of the preheated oven. After about 25 minutes of baking, check the tart. When the filling is done, it should be cream coloured but firm to the touch. It should just barely begin to turn light brown. The shell should be light brown as well. Be careful to not overcook the filling or it will loose its creamy texture. When the filling is done, remove the tart from the oven and allow it to cool completely at room temperature. While the tart is cooling, prepare the peaches. Put the 2 tablespoons of sugar and the lemon juice in a medium sized bowl. If you're using nutmeg instead of anise blossoms add it too. Next, blanch the peaches to remove the skin. Place all the peaches in a deep bowl and completely cover the peaches with boiling water. Let the peaches sit under the boiling water for 30 seconds to 1 minute then pour the water off. Next, cover them with cold water and allow them to sit for another minute and then drain them. Using a paring knife, pull away the skin from each of the peaches. The skins should come off quite easily. If some of the skin resists, repeat the blanching process. Once you remove the skin from all the peaches, slice each of them in half, remove the pit and slice each half into 3 pieces lengthwise. As you create the slices, place them in the bowl with the sugar and lemon juice and gently toss to coat them. This will prevent them from oxidizing and turning brown. Remove the tart pan from the sides of the tart and then slide the tart shell off of the base on to a serving plate or cake stand. Using a slotted spoon, place the peaches in the middle of the baked filling and spread them around to cover the filling. I find that arranging them so the pit side doesn't show makes the tart look best. Sprinkle the blossoms on top of the peaches. Lick your Vegetables. Make Popsicles. When the thermometer in Ottawa recently hit 36.3˚, a few degrees short of a record, I was looking for things to serve at a dinner party that avoided turning on the oven. It was either that or have my guests run through the sprinkler. Inspiration struck when I was picking herbs in my garden and noticed my neighbour handing her kids home made popsicles. Ding! 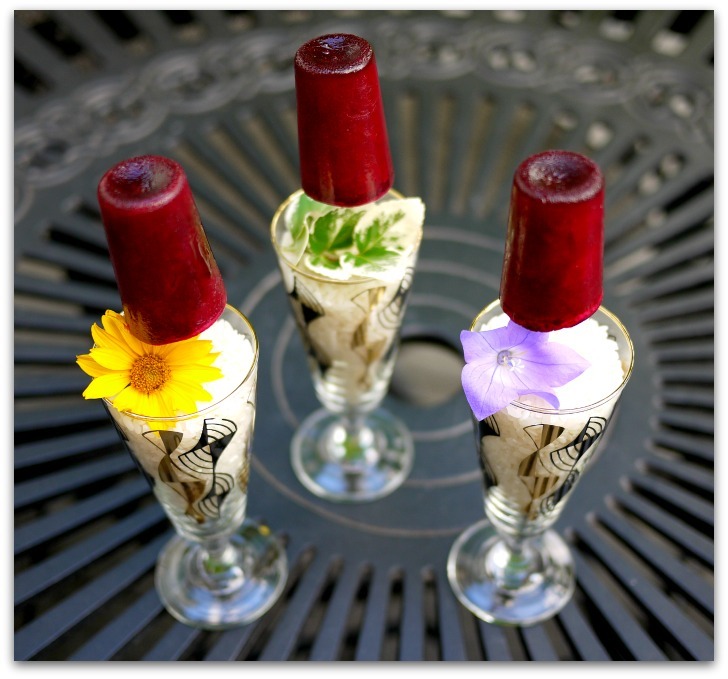 Why not serve some vegetable juice popsicles as a first course? A bit of digging in the basement and found my classic popsicle moulds, a remnant from years ago when I would baby sit my young niece. These popsicle molds typically come with little red holders but I went with white lollipop sticks to make them more chic. You can buy the sticks at Bulk Barn or Michaels. I'm lucky enough to have a juicer but if you don't have one, you can always buy pre-made juice from a natural food shop or have a juice bar make some for you. 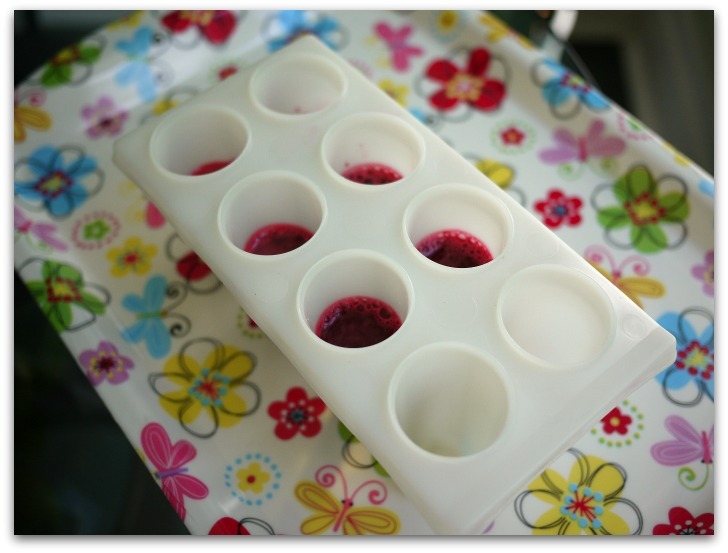 If you'd like to be creative with the shape and try something fun, Silpat makes many pastry moulds that you can use and the good news is that the popsicles can be popped out easily after they're frozen. Large lollipop sticks or holders. I recommend you don't use wooden popsicle sticks because they taste strongly of wood. Red Head: beet, carrot, fennel. Garden Gate: Snap pea, carrot. Mexican Fiesta: Tomato, celery, coriander root and red pepper. Gazpacho: Tomato, cucumber, red pepper, and celery. You can also layer the popsicles by using several different coloured juices and freezing them layer by layer. Try it with the Red Head since these are three flavours that taste great on their own. Use any flavour you think would match the other things you're serving or one that would please your guests. 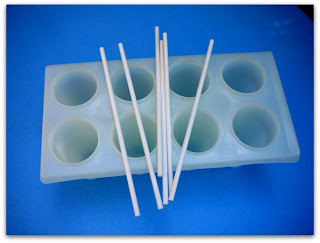 If you are using a standard popsicle maker like in the photo, each receptacle holds 1/4 cup (50ml) (50g) of liquid. For other moulds, measure the volume with water and multiply the amount by the number of popsicles you want to serve. Three hours or more before serving, pour the juice into each receptacle until 3/4 full. Freeze for about 1.5 hours and check the set. Insert one of your popsicle sticks. If it doesn't stand straight up, freeze for another 15 minutes and try again. Once the sticks are in, leave to freeze solid. To remove the popsicles from the classic forms, you can wrap your hand around each one individually and pull. 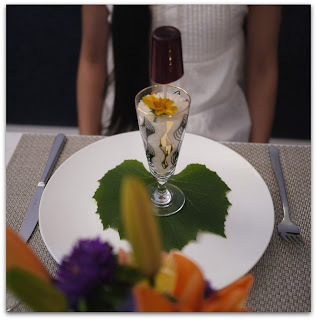 To serve, you can hand one to each guest but for a more formal presentation, Like in the top photo, fill a deep glass with rice and stick the popsicle stick into it.